Only 24% of sales emails are opened. The average person deletes 48% of the emails they receive every day. In other words, you’ve got to knock it out of the park when you write a follow-up email to prospective clients—otherwise you will quickly become part of that 48%. Let’s take a look at what it takes to make it in the 24%. Every business uses different strategies regarding follow-ups at each touchpoint. Research suggests that an optimal cadence strategy allows more time between emails at first and then applies a half-life rule for each subsequent email or call. For instance, if you wait two weeks to contact a prospective client, you should follow up that email six days later (then three days later, etc.) to create a sense of urgency. Recap the top value adds you discussed. Provide demos of your product, videos, or any resources you might have to influence buyer decision. Visualize your email cadence and determine how your business should communicate its value proposition with this Lucidchart template. If you’ve ever wondered what to say in a follow-up email, you’re not alone. Many professionals search for best practices on how to write a follow-up email, but the truth is that nobody has a secret recipe. However, we do want to point out an important ingredient: authenticity. Have you ever read a follow-up email that sounds like it came directly from a form and was aimed at a mass audience? That’s because it probably was. And what do you do with that email? You delete it without reading it. The crafty salesperson will take the extra few minutes to incorporate a human element into their follow-up emails—even if it’s templatized. Even though your emails should be short (three or four short paragraphs max), you can still add in personal details that extend the initial conversation you had with your prospect. Additionally, you really should try and include new information about your product and the benefits it provides in every part of your cadence. It was great speaking with you and Mr. Halpert today about Lucidchart! I’m so glad you feel that Dunder Mifflin could benefit from our software—we agree! It will definitely streamline processes and help your boss, Michael, get a better sense of everyone’s roles. Security and reliability—all documents are stored and encrypted on servers with no downtime. Easy to use—even your most “technophobic” workers will be able to use our drag-and-drop interface to create professional diagrams. Cloud-based mobility—our platform works on Windows, Mac, and Linux systems, as well as mobile devices. When would be the best time to schedule a demo? I’d love to show you what else Lucidchart can do. P.S. Snakes. Squash. Star Wars Episode VIII." We wanted to throw in a joke for fans of “The Office,” but in all seriousness, a postscript both personalizes the email and creates a sense of urgency. It doesn’t matter what your tone is—just ensure it’s consistent. In the follow-up email sample above, we used a very friendly but informative tone that lets the customer know that we a) remember and appreciate them for who they are and aren’t just another lead and b) we have a unique solution for their unique situation. Keep the conversation going. Pick demos you know they’ll appreciate, showcase the dynamic range of your product. Good email content will offer something new every time. If you’ve developed a friendly yet professional rapport with your potential lead, your first follow-up email subject header doesn’t really need to be excessively creative. However, there are some tips to keep in mind as you continue to build your cadence within Lucidchart. Create a sense of urgency with each email. It doesn’t have to be “Dear Jim, sign up now before it’s too late!” However, you might want to mention exciting deals or packages available. Keep the subject line personal. No two subject lines should read the same. Also, adding the prospect’s name can go a long way in making the prospect feel that the email is personalized (as it should be) and not a form. Remember, you want them to realize you’re thinking about them. Keep the subject slightly mysterious and unique. Don’t give away your answer in the headline. Otherwise, why will they click? Offer an interesting story or noteworthy information. All your emails need to be relevant and less about you and your product. Rather, how can you and your product help your prospect? Why is this week’s offer different than last week? Because let’s face it: we’re not just checking in—that’s something we do with distant family members. We have specific objectives and want to close the sale or determine if the prospect is no longer interested. 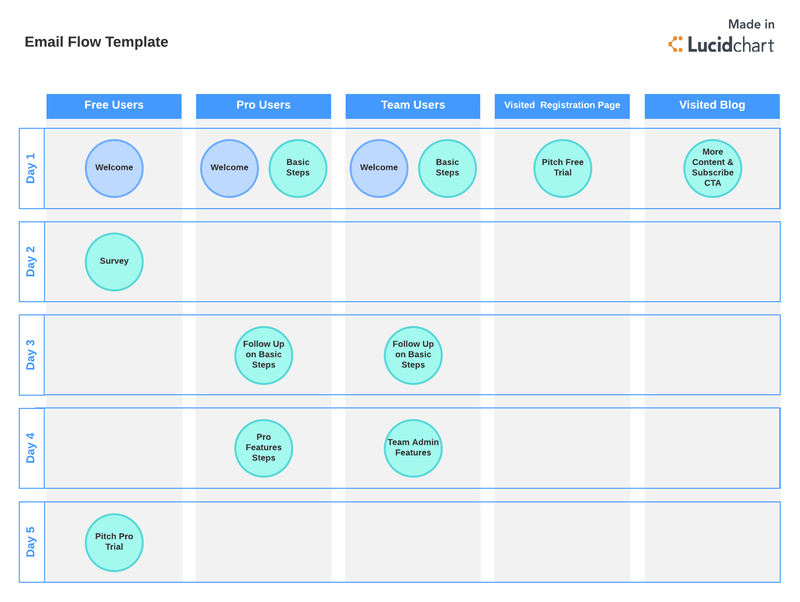 Remember, you can visualize all of your processes and touchpoints within Lucidchart. Take a look at our email wireframe template that can further help you customize your cadences!